The 38-year-old left his wife and children in Palestine and paid nearly $2,000 to get to Europe. He and his friend Ahmed crossed the River Evros the day before in an inflatable boat with eight other people. Then they walked all night through forests and fields till they came to Soufli. It is extraordinary meeting people at this stage of their journey. Most are exhausted and relieved to be on European soil. As I saw reporting in Athens, it’s not long before this relief turns to despair. Most are oblivious as to what lies ahead. I met a hopeful and sweet Iranian woman named Yasmin who made the hellish journey from Iran with her Afghan husband and their two young children. They walked for days through the mountains in Iran, always fearing capture and deportation. From Turkey they crossed the River Evros to Greece, where they were arrested and spent a month in a reception centre. They paid a Greek man €4,000 to “organise” their trip from Iran. Yasmin hopes to find him in Greece because they don’t know how to get to Switzerland, which is where he promised to send them. Yasmin says she has no problems with her country and doesn’t want to claim asylum. But as she is married to an Afghan, life is difficult in Iran. She hopes her husband, a teacher, will be able to study and teach in Switzerland. But her family have been given a deportation order to leave Greece within one month. And of course they have spent all their money on the smuggler, so there is very little chance they will make it to Switzerland legally. The information available to people trying to seek a new life or asylum in Europe is extremely poor. These people are usually the most vulnerable and have no papers in their own countries, which is why they travel illegally and don’t simply a plane ticket. The only source of information is a vast and mystifying grapevine, which peddles myths and assumptions without which many might not have even left home. A popular myth is that everyone who is not from Somalia or Afghanistan will be deported, and so many lie about where they are from. Though not everyone wants to try and navigate the system. 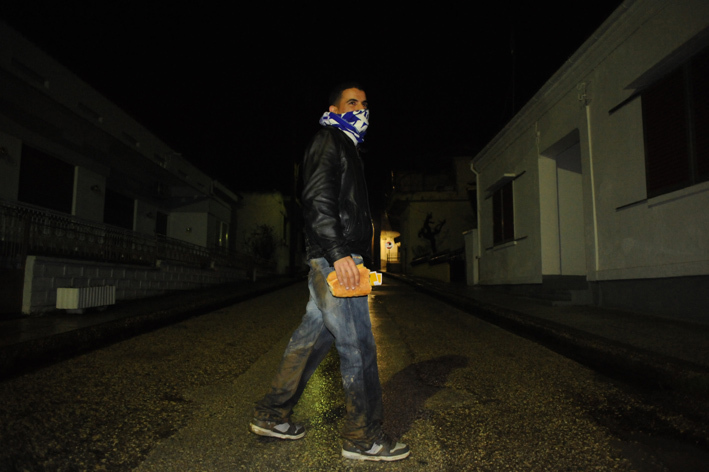 Ersham, a 20-year-old from Layounne in Morocco, who arrived in Greece one morning with muddy feet and a big grin, is happy to avoid the police. Instead he and his two friends want to get the next train to Athens. “We want to work, we want freedom, we want a nice life,” he says. 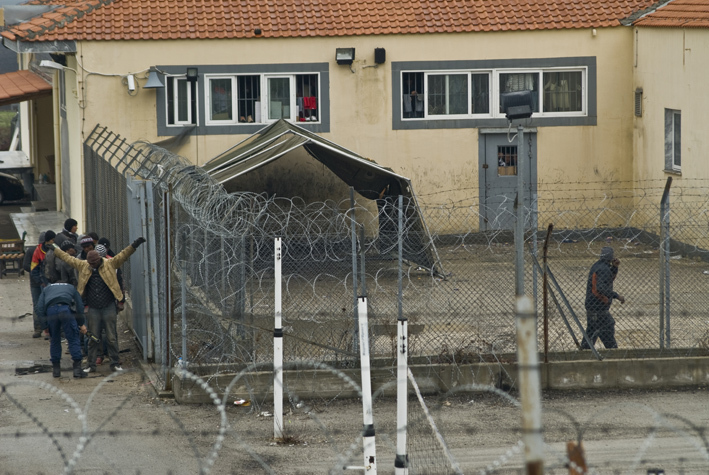 Those that are arrested are taken to either the purpose-built reception centre in Filakio, which holds 350 people, or to one of the smaller border town police cells. Journalists and members of the public aren’t allowed to enter the centres, but I interviewed Médecins Sans Frontières about what they’ve seen inside and it’s pretty hideous. More on that in a later post. I hung about outside Filakio centre for a few days, asking questions and getting no answers, but soon the guards began to lighten up and became remarkably chatty. They find their job incredibly difficult. They are in a precarious position; the inmates are not criminals but they imprisoned like criminals, which means it is easy for the officers to slip into that mentality. (To be fair though all the migrants I meet leaving Filakio, insist the guards were good to them). He adds: “It makes me sad. The first day is always sad, but the second day is better because they settle in. They have nobody to help them. If sometimes a mother needs milk for her baby, we give them money. Legally the longest a person can be kept in a reception centre is six months. On release they are given a piece of paper in either Greek or English which says they must leave the country within one month. The ones who have no money are released on to the streets; they usually end up walking miles to the nearest big town. People with money can buy a bus ticket for €65 to Athens. I watch one afternoon as around 50 migrants from the Congo, Afghanistan, Senegal and Iraq desperately try to squeeze themselves on a coach bound for Athens. Out of the confines of the reception centre the hope that bought them to Europe returns. Everyone is happy and they are expecting better luck in Athens. Hadim, 30, from Senegal, tells me about the horror of crossing Evros on an inflatable boat with 20 other people. “Man, if you laugh, the boat will fall. Don’t laugh, don’t laugh,” he says. Hadim paid a smuggler in Istanbul $100 to help him get to Greece. Uhmert, an 18-year-old Afghan, is less jubilant; he found the journey difficult and at times regretted leaving his family. Why did he leave? “You know why our country is not good for living.” He paid $6,000 for the entire trip. His young face looks suddenly tired when another Afghan says he paid $2,000. It seems the smugglers take what they can get. Hadim simply said he had no money, so the smuggler happily took his $100, while Uhmert paid $1,500 at this stage of his journey. This is not the end of Uhmert’s difficulties. He and the others will join the tens of thousands of migrants already in Athens without papers. He might escape to another European country, but a wave of anti-immigrant feeling across the continent means it is unlikely he will be able to settle unless he is one of the few given refugee status.